This is the finished, stained and sealed front view of the box. You can see one of the crystal handles to the left side, and the pinkish hue the pecan stain brought out of the wood itself. The moldings darkened slightly at the top and bottom of the box, and the oak on the corners actually lightened up a little, especially after I put the crystal coat sealant on it. Since this toybox was for a little girl, I wanted to decorate it with something she would like. I settled for these purple glass handles, which I got from Restoration Hardware. When installed they looked very nice against the slightly pink wood behind them, and reflect the light in an attractive way. The woman I gave the box to said her stepdaughter would love the box, especially the handles! The box was stained on the outside using a pecan color, and the inside uses a cherry stain to help match the cedar floor. 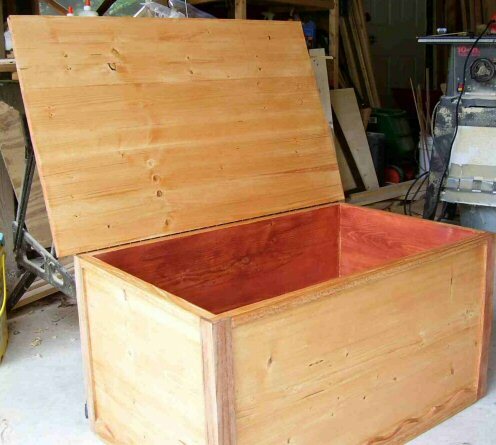 The cedar stain brought out a pinkish hue to the spruce wood, which was very appropriate for a girl’s toybox! 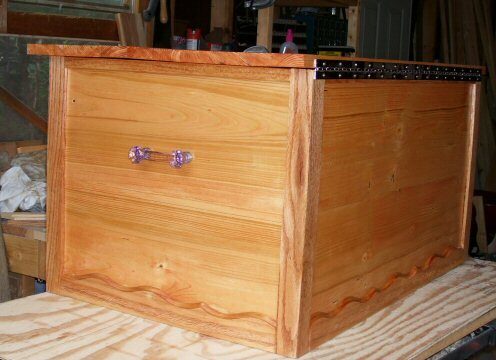 I used a rabbet joint to assemble the box for both this toybox and the third one I made. 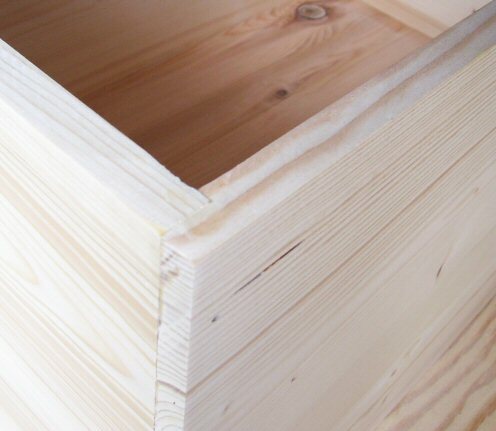 When glued and fastened using small nails, it is a strong joint that will withstand lots of wear and tear. The corner is further protected by exterior oak molding that covers the ends of the boards, and are beveled together to create a new corner. 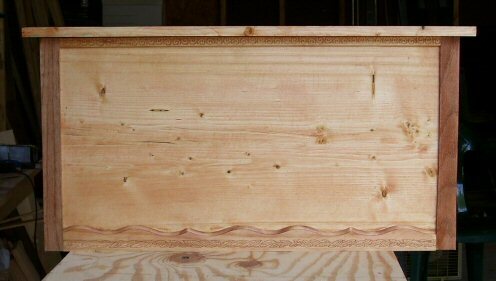 I made the bottom of this box out of cedar planks to allow it to be used as a hope chest in the future. The bottom is supported by a series of 3/4″ struts underneath the planks, which are smooth on the top but very rough on their bottom. 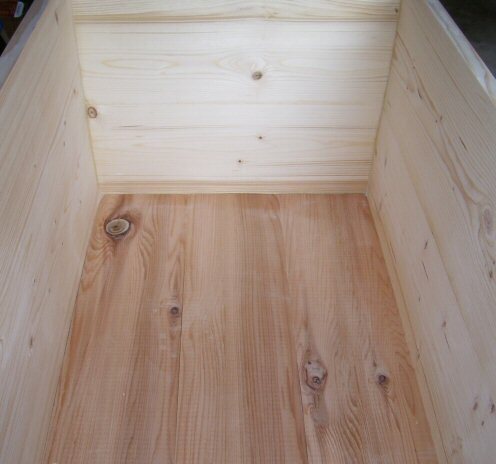 The interior of the box walls and the floor have been sanded prior to staining.